DOCTOR WHO Pure Historicals - THE GUNFIGHTERS | Warped Factor - Words in the Key of Geek. 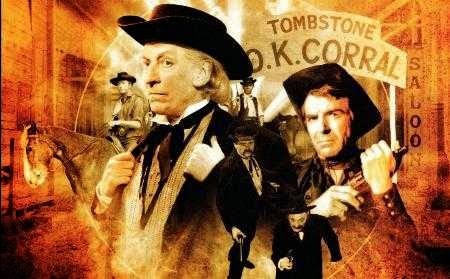 Christopher Morley belts out a verse or two of The Ballad Of The Last Chance Saloon, and brings us the next Doctor Who pure historical adventure - The Gunfighters. Don a Stetson & pull yourself up a seat in the saloon bar, boys & girls- we're off to the Wild West for The Dodo, The Astronaut & The Elderly! Or should that be The Gunfighters? 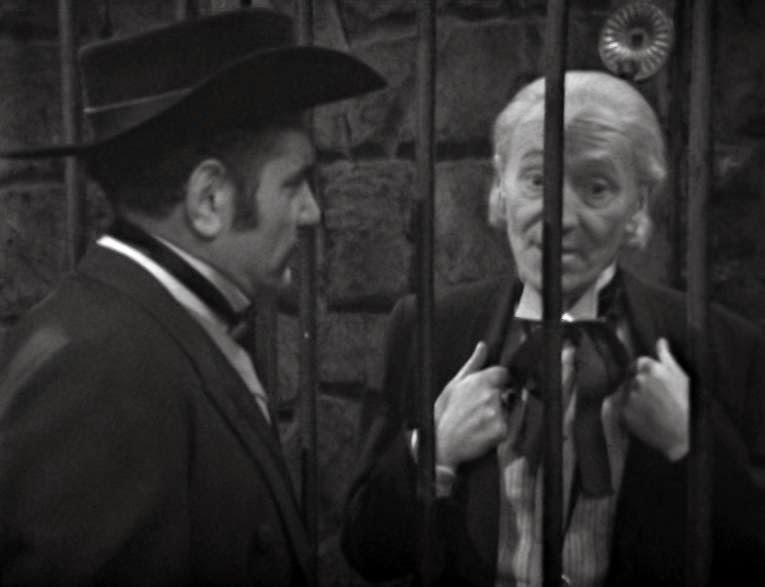 As well as being the penultimate entry in the run of Hartnell's Historicals ( before a meeting with some pirates in The Smugglers), this is notable in that old Bill himself suggested the setting- perhaps compensation for the rejection of his earlier idea The Son Of Doctor Who, an attempt to expand on the Time Lord's familial ties. Just to add to the Western atmosphere, set a little Ennio Morricone playing in the background. Savour what must be among the great Italian film composer's work and read on. After their escape from the Celestial Toymaker ( The Celestial Toymaker), the First is complaining of toothache. ' It could have been worse', his companions might console him. ' The TV Lords considered sentencing you to a quick change of appearance mid-game a little while back!'. Might not have come as even a sliver of comfort to the Doctor that he's escaped for now though. Damn those troublesome gnashers! Steven & Dodo are overjoyed to find themselves in this corner of time & space though, & rush off to change into what appears to be surplus ' cowboy' stock from a local fancy dress shop. Their Time Lord friend & protector is still more interested in his teeth, though. Is the Wild West really the best place to find a dentist? The Clanton brothers want a man who sounds like he should be a health professional too- Ike, Phineas & Billy are out for revenge on Doc Holliday for the killing of their brother Reuben. Turns out the Doc is actually a dentist after all on the side as well. Fancy that. His CV also reads ' gambler & gunfighter' as well as ' tooth yanker'- what a guy. Steven jokily suggests that he's 'the fastest gun in the west', which is overheard by a rather famous Marshall- no less than Wyatt Earp. If you hadn't guessed where we are yet, you might now! Its Tombstone, Arizona..
Of course, writer Donald Cotton has forgotten something. Where here Holliday & Earp are presented as fugitive & lawman respectively, they were actually allies- Holliday saving Earp's life in 1878 shortly after Wyatt had moved to Texas from Kansas. Never let the facts get in the way of a good story, hmm? Steven is taken into custody for his own protection & presumably learns to play harmonica while he's at it. Somebody else heard the whole thing too- the Doc's lady friend Kate Fisher, a singer in the Last Chance Saloon! Why give a bar such a name, you may ask. Well, often such places were indeed the last chance for anyone passing into a state where alcohol was prohibited to stop in & have a drink. No wonder they proved so popular & indeed passed into common metaphorical usage, eh? By the time the First & his friends arrive there, the Doctor's concocted a brilliant cover story for them all- he's Doctor Caligari, part of a travelling band alongside his pianist Dodo Dupont & singer Steven Regret- as in ' once they hear him sing they'll wish they hadn't'. And they should know, probably having heard him warbling in the TARDIS shower more than once. Two incarnations later of course the Doctor who doesn't like to be referred to as ' Doc' will take opera as his own preferred showery sing-along. In case you're wondering, he's exercising his vocal cords to La donna e mobile, from Rigoletto. Whether he was there with Verdi at any stage in the writing process or attended the première of the work in 1851 isn't known. For now though, he's got to show off his own musical skill- to a higher standard than his lyre playing in The Romans, of course. He might have got away with it in front of Emperor Nero but somehow an audience of drunken cowboys might not be so agreeable. First things first though. Its time to fix his tooth! At first, having seen the ramshackle condition of the place he's reluctant to go in like millions of people terrified of a trip to the dentist. But having been encouraged by Ms Chaplet, who says he'll get a sticker & maybe even a lollipop for being a big brave boy, he enters to find the other Doc & Kate in a romantic clinch. Seeing it as an excuse to leave post-haste, he offers to leave them to it. But Holliday's overjoyed to have a first client of the day & bids him to sit down with the offer of either booze or a knock-out punch by way of an easy anaesthetic. His friends are busily trying to book rooms for the travelling party at the Saloon ( the First's been saving up vouchers) & sign themselves in under their singer & pianist aliases. Which pleases the bar owner, Charlie- his last piano player got himself shot & so is unable to play. Unable to get Elton John at short notice, his problem will be resolved following a monumental mix-up between Docs that results in the Clantons thinking the man in the smoking jacket & Stetson is Holliday. Back at the bar, Steven & Dodo are quickly forced to think on their feet! 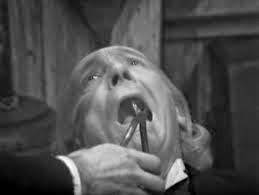 It could be the last song the Doctor ever hears, at least in this old body- as he approaches the Saloon it looks like he might be about to breathe his last. Holliday's too busy gloating over his stroke of luck in avoiding such a fate himself to notice that Kate's gone off to warn the First, who'll be gutted his colleagues didn't at least consult him before nay-saying Cydonia. He didn't nip to 1954 & help Leo Fender design the Stratocaster for nothing, you know. That & the hours spent learning every note wasted, though he does at least now have a tasty stockpile of guitars for future jams. His Third incarnation might want to have a bash before he goes off to Devil's End, say, or the Tenth upon finding himself in The Satan Pit. Back at the West, though, & Kate has eased Dodo off the piano in an effort to distract what might be termed cowboys from hell. Dodo takes it completely the wrong way, though. 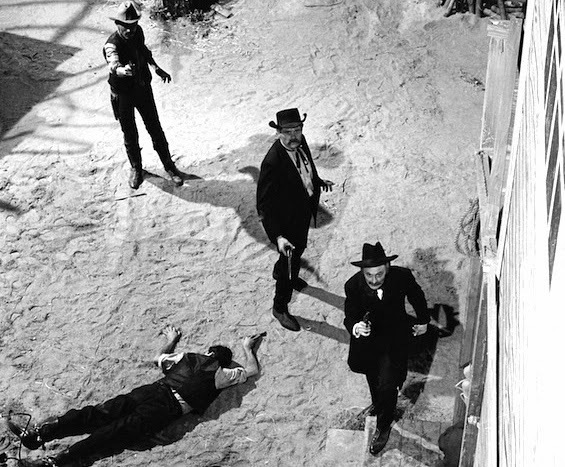 The Clantons have their own supporters, though, leading to a stand-off! It's at this point that another great outlaw, Johnny Ringo, is introduced. Pa Clanton wants to use him as a hired gun in their vendetta against Holliday..History records that such an affiliation did indeed happen, but not in this particular feud. In this case though, Johnny was to have been played by one Patrick Troughton, who proved to be too busy to take the role but would have quite another come the ending of The Tenth Planet. Its impossible to tell now how Pat would have played the part, of course. But the man who does here, Laurence Payne, does a brilliant job of turning Ringo into the prime exponent of the ' be quick or be dead' philosophy. Arriving at the Saloon, he tells Charlie that he too wants to snuff out Holliday- but strictly on his own terms. ' I won't tell anyone' says Charlie. Ringo agrees with him, then shoots him just in case he decides to go back on his word. We're now coming up to a certain famous gunfight at the OK Corral! Which means precious few survivors. Mercifully for the Doctor's long-term future, 'Johnny Ringo' isn't an alias adopted by his next self. If it had been there's a high possibility that an awful lot of regenerations would be happening at high speed, with little time for each new incarnation to get used to the whole ' living' thing. And besides which, when was the last time you saw an outlaw with a recorder? The day will come when the Doctor will proclaim Stetsons 'cool' & have a go at being a Marshal himself. He'll even help a horse explain its lifestyle choice. 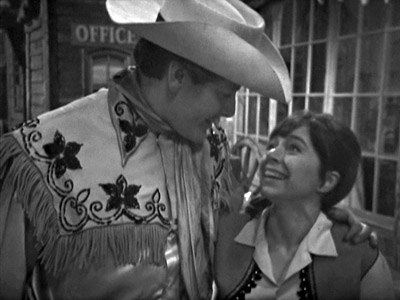 But The Gunfighters is where the West began for the Time Lord, an age before he praised his headgear. There's no denying its worth it on this occasion, though!